Packaged in a 20-gallon drum, the kit can be placed in key locations throughout your facility and is easily identified by the bright yellow color. For fast transport to a spill site, it includes handy, easy-to-grip handles around the drum. 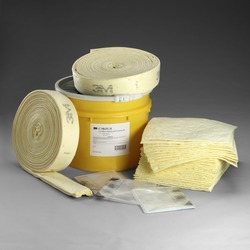 Each kit contains 2 rolls of folded sorbent (each 5 inches by 50 feet), 30 pads (each 17 inches by 19 inches), 3 temporary disposal bags and ties, and one 20 gallon yellow drum.